Several years ago I read East by Edith Pattou. Last year I read Sun and Moon, Ice and Snow by Jessica Day George. Both were retellings of the Nordic legend, "East of the Sun, West of the Moon." You might think, given its title, that this book would be another retelling of the same tale, but it's not. However, it is beautifully woven into the plot. Astri's life is hard. Her mother died several years before, and then her father left for America, leaving Astri and her younger sister, Greta, with an aunt and uncle. He promises to send for them when he has earned enough money, but quite some time has gone by without any word from him. Then the aunt decides to sell Astri to the goat man (she's not what you would call kind and nurturing), and that is when life becomes truly unbearable. 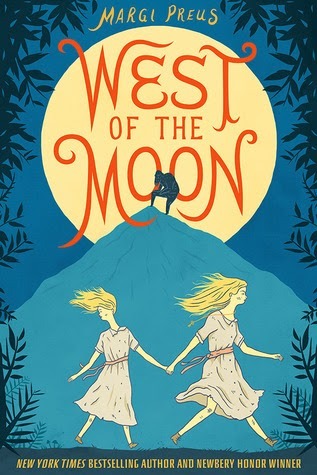 Gathering all her courage, Astri and Greta set off on a dangerous journey to find America that is "west of the moon." This is an insanely clever book. It's part folk tale (at the back of the book, Margi Preus lists 14 folk tales that come into play at one point or another), part historical fiction (the diseases and journey by ship are all accurate to the time period), and even (very slightly) part biographical (the story was inspired by Preus' great-great-grandmother). The melding of these various genres was absolutely beautiful. First, the folk tales. I know I didn't pick up on all the references, but the ones to "East of the Sun, West of the Moon" are pretty obvious, mainly because throughout the story, Astri recounts bits and pieces of the legend and then relates them to her own life. For example, this, in Astri's own words: "When the youngest daughter arrived at the bear's house, it was a castle she found, with many rooms all lit up, rooms gleaming with gold and silver, a table already laid, everything as grand as grand could be . . . Not so for me, for when I come to the lair of Mr. Goat, it is a hovel, and filthy inside." The story wouldn't have been even half as good without the framework of all those old tales holding it up and tying it to the past. The story is set around 1850. It begins in Norway and ends in America. Astri is an uneducated farm girl and is highly superstitious, but all of her unfounded beliefs actually have logical explanations. For example, there is a girl in the story whose joints and back seem to be curved. Astri is convinced she must be the daughter of a troll, but more likely, she probably is suffering from the long-lasting effects of rickets. Astri was such a wonderful main character: headstrong and brave and loyal, but she continually doubts herself and is disappointed by her failings. At one point, she steals the goat man's Black Book (among other things). She is convinced the Black Book contains powerful secrets that might help her, but she also worries that it is evil and she belongs to the devil because of it. At one point she says, "It's said that it can be dangerous even just to listen to words from this book . . . But I only want to use it for good! Is it all right to use a bad thing for a good cause?" Her struggle is so real and so admirable. 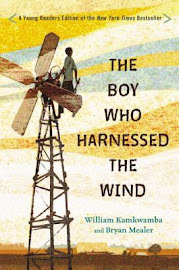 Although this is a middle-grade novel, I would put it in the upper-age bracket of that category. There were a few intense moments (the goat man forces himself (very briefly) on Astri and then promises that once he marries her there will be no escape; later on, Astri cuts off his fingers when he tries to steal her mother's brooch, and the resulting blood and tetanus are not pretty to behold) that I think warrant a more mature reader. The book itself (I'm talking about the physical, hardcover, paper pages book) is gorgeous. I want to own it someday just so I can flip through its stunning pages. The first few pages are black with white printing and surrounded by a frame of leaves. I also love the choice of fonts. "There are more things in heaven and earth than can be dreamed." "It makes me dizzy to consider it, but I feel suddenly how all things are woven together, all things seen and unseen, all things alive now and that once were, for generations back and generations to come, woven of a kind of golden thread . . . "
"Oh, it's just a trifle. A trifle here and a trifle there. But as we well know, a trifle can be enough when luck is on your side." All around it was just a really great book, one that I would definitely recommend to 12-year-old girls, although I think there's definitely enough action (and blood) to keep boys interested as well. 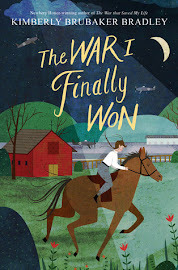 And as far as the 2015 Newbery? I guess it's probably obvious I wouldn't be one bit disappointed (or surprised) if this one won. P.S. 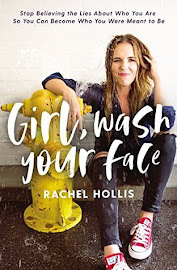 I've said before that I don't like to read reviews before writing down my own thoughts, but after I finished writing this, I went over to For Those About to Mock and read Rachael's thoughts. We expressed many of the same sentiments (which must mean it really is a good book), but she did it infinitely better.